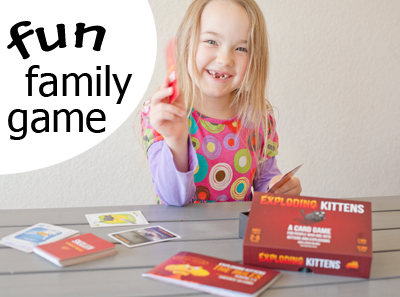 Today’s game is one of our current favorites because it’s quick, simple and hilarious! Exploding Kittens is described as “a card game for people who are into kittens and explosions and laser beams and sometimes goats,” which is a small small taste of the satirical humor you’ll find on the cards. It’s a game of strategy and chance that my 6 year old (who can’t read yet) can play on her own now, after a couple times of being on my team and becoming familiar with the cards. Basically, you draw a card every turn, and when you get an exploding kitten card, unless you can diffuse it, you’re out of the round. There’s enough strategy to make it fun for adults, unlike Uno or heaven forbid Go Fish that make me nearly lose my mind with boredom. Of course, the hilarious illustrations and captions on the cards add a lot, as well. Be sure to check out the other games I’ve shared!